Here at the Center, we are participating in MayDay. Over the years, a lot of people have given us precious papers, photos, artifacts, and more to preserve and make accessible. To be good caretakers of these gifts, we have to lessen risks and plan how to respond to emergency situations. The WVRHC has a Disaster Team that meets monthly to look at risks to our collections and to compile and update our disaster response plan. We met last week to talk about how we would salvage books if we had a water leak, how we can keep the humidity steady, and more. 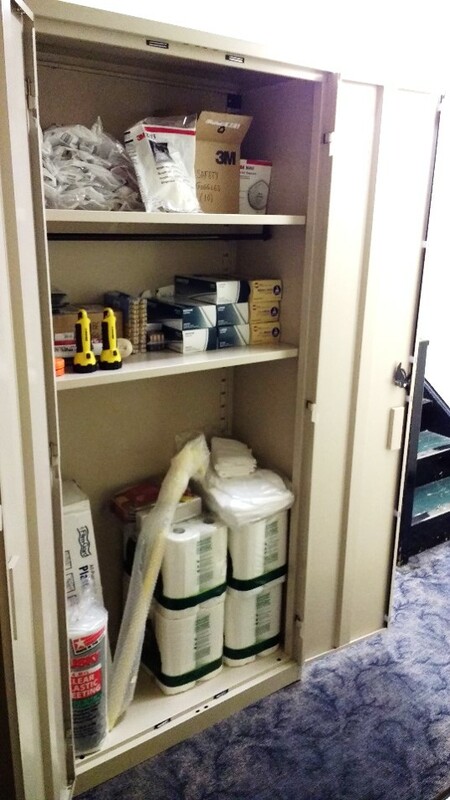 We’ve also put together an emergency contact list and started stocking supplies we will need in an emergency, including protective masks, flashlights, gloves, and more. Today, my MayDay task will be to put the finishing touches on the latest version of our disaster response plan. Later this summer, the Team will hold a tabletop exercise with our department, so we can talk through an imaginary disaster to make sure our plan is sound and that everyone understands what to do. 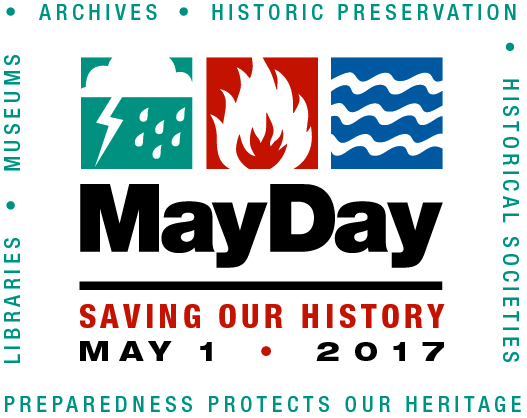 MayDay isn’t just a good idea for libraries, archives, and museums—it’s a good idea for everyone! Here are my top three ideas for ways you can celebrate MayDay at home. MayDay focuses on protecting the valuable historic materials that we keep, but preserving human life takes a higher priority, so my number one suggestion is to make an emergency plan for yourself/your family. For example, you can take 5 minutes today to plan how you’ll get out of your apartment if there’s a fire in the hallway, or to practice evacuating yourself and your dog out of your bedroom window. a place that gets very hot, damp, or cold—different types of items can tolerate different conditions (for example, cold storage is good for photos), but hot and damp environments make mold growth a greater concern, and environments that are too cold can make materials brittle. If you can, also avoid storing important things in a room that has wild fluctuations in temperature and humidity. in direct sunlight—if you have photos in a box that the sun shines on, you may be fine. If you have a pile of photos sitting in the sun, the sunlight will make them fade over time. on the floor—if you have boxes on the floor and you can raise them up four inches (on cinder blocks, on shelves, on milk crates, get creative! ), that might save you from a soggy mess if you have a leak or a very small flood. Back up your digital files AND keep track of your backups. It’s annoying, but it’s worth doing. Trust me. I saved a lot of old Word documents and photos, including many of our dearly departed golden retriever, onto a backup hard drive, but thanks to poor tracking on my part, that old backup hard drive eventually contained the only copies of some of my files. Then, without warning, that hard drive stopped working. It’s also worth storing your backup copies away from your originals, if possible. 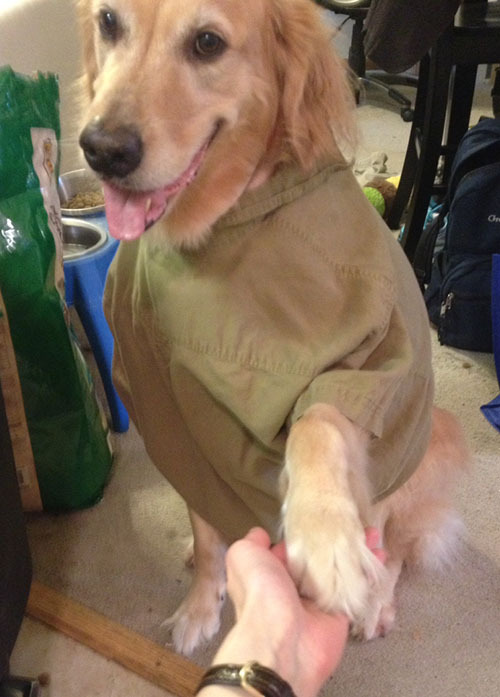 This photo of Riley lives on because it was saved on my work computer. Lots of copies keeps stuff safe!